I believe any opportunity to educate another human being should be a sacred moment. In my sports medicine degree work, I was exposed to quite a few physical education classes because Athletic Training Pre-Physical Therapy or Sports Medicine are often taught within the Physical Education Department. When I witnessed the opportunity that physical educators have to develop people, I realized the sorry state of physical education. The work of Dr. Ed Thomas and the Jeffco Fitness video I shared in my previous article display the positive influence that physical activity can have on a child’s grade point average. The benefits of exercise in academia, health and self-esteem are clear. The end goal of an English class, a math class or a psychology class is a state of entry-level competence and functional independence. What is the end goal of physical education of our youth? No, not the physical education that you had and not the physical education that your child may (or may not) be receiving now. Let’s go back to the physical education that was dropped on our parents—the baby boomers. Are these people physically independent when they make their health and fitness decision or do they basically just surf the internet or migrate to the first professional that seems to have the right credentials? I have enough math skills to know that if I rely on someone for mathematical problems, they’re at least doing the basics right. It goes back to addition and subtraction, right? Put it this way: I’m not going to get taken advantage of buying a new car. I have thought that my mom or dad might get taken advantage of at a physical therapy clinic, a chiropractic clinic or in a gym. I don’t think these people are trying to be underhanded—I simply don’t think that they’re the expert my parents believe they are. Every one of us has an ulterior motive for doing what we do, and any time we can sell somebody something that they’re confused about, we win. The insurance industry is built on fear. They charge you now for something you’re afraid of in the future. I want to make sure that health and fitness don’t have to be that way to be successful. I believe that a Physical Education class, if restructured and rebuilt from the ground up, would physically empower kids to overcome obstacles. Real, physical obstacles. Today we’re going to climb, tomorrow we’re going to skip the next day we’re going to run and then we’re going to throw things, were going to lift things but the first thing we should probably learn to lift is you. We’re going to experience physical obstacles and create challenges. Those challenges will in turn create failures. Not the kind of failures you’re going to obsess about—we want the kind of failures that tell us the exact type of development that you need. We know that sometimes the fastest people might have the biggest flexibility problems. We also know that some people with no flexibility problems may not have the acquisition of strength they desire. We should scale the physical challenges away from games and more toward physical obstacles to allow those without an athletic affinity to have a physical presence in their lives. The most rewarding physical activity you can have is one that, by chance or design, is scaled to you—a challenge that involves full engagement. A bested worthy opponent. Dr. Ed Thomas talks about this concept a lot and he talks about a physical culture, a culture that embraces its physical attributes as much as it’s academic, intellectual, or architectural attributes and I feel the same way. As physical rehabilitation and personal fitness professionals, we need to think of ourselves as educators. How would we engineer a class to make a child feel independent with basic health and fitness decisions by the time they graduate from high school? As a physical therapist, I often treat people who have already exhausted all of their insurance money. They come to me out-of-pocket and immediately expect me to do significantly more in one or two visits than the previous professional did after the twelve visits that exhausted all of their insurance resources. I’ve accepted that challenge and many times I’ve closed their case in three visits spread over three weeks by having them listen to the right advice and do the right thing. Am I an educator or a therapist? Yes, I am. The effects of my treatment will quickly be absorbed into the rhythms and patterns of life, but pivotal education is a game changer. What does that say for our medical and physical culture? We’re wasting a lot of time and not creating independence in our clients or our patients. Do we want them to be well and go tell others about their experience or do we want them to keep returning as continual consumers? For my conscience, I would rather create independence, but that independence could easily start much earlier in our educational system. Why are we not independent with our healthcare decisions and fitness decisions? We’re expected to be independent with other decisions we make about finance, communication or business. Tim Harford wrote a beautiful book called Adapt that focuses on how nature and the environment make us develop. Nature gives us lots of opportunities to fail. Not failing is how nature pats us on the back with success. Great—until you remember that failure in nature can sometimes take your life or injure you severely. We often try to physically develop people better than the environment can. I want you to embrace the fact that we can’t do it better than nature. Often, when we’ve tried to develop one attribute better than nature, we’ve done it at the expense of another attribute or some other quality. There’s something about the way the natural environment develops us that will not let us go below a minimum accepted level of competency on another metric while pursuing the one of your focus. That is exactly why we should try to develop a system based on nature. Start by following three simple principles from Adapt. Number one: Variety. As in nature, you have to be exposed to a lot of variation to develop. Not every one of your interactions with new activity is going to be a success . . . or even rewarding. When you have a lot of variety, expect to have a lot of failure, which brings us to. . . Number two: Failure. Make the failure survivable. We run into this frequently with the Functional Movement Screen. When I tell someone that I don’t think they should load their squat because their squatting pattern is really dysfunctional, they inevitably say “But tomorrow is squat day.” If your squat doesn’t have enough integrity to benefit from the load why do you persist in the load. I didn’t say don’t work on your squat. I said don’t load your squat. Many runners misunderstand me in the same way. Their volume of running is so much that it will not allow change to occur in their fundamental movement. They need that dysfunction and compensation to maintain their mileage with all the other issues they have. If the compensation stays alive, then the reason for the compensation also stays. From the movement screening standpoint, we remove that by restricting a physical activity. We interrupt your program, we interrupt your groove and we interrupt your vibe. We steal the momentum from a dysfunctional pattern by not doing it. We interrupt that thing that you want, in order to replace it with that thing that you need. All we really injure is your pride. Number three: Feedback. Make a clear feedback loop for non-failure and ensure that it follows a systematic development. Remember, the Rolling Stones told us that you can’t always get what you want . . . but you get what you need. If we’re in control of somebody’s health or fitness we should first concern ourselves with their needs. Help them see that addressing the need could get them a little closer to the want. I’m forty-eight now (you probably figured that out from the Stones reference). I will always take an injury to my pride over one to my body. I’m not necessarily sure an injury to my body will make me better, but most injuries to my pride enlighten me in some way. If the failure doesn’t have a feedback loop built into it, then it’s not nearly as instructional as it could be. If we (as coaches, trainers, teachers, educators and rehabilitators . . . human beings) are going to step into the arena of development for health or fitness, then we need to remember that we can’t do it better than the environment. I think we can do it faster and safer than the environment if we are principle-based. I’m not trying to do anything in Functional Movement Systems to circumvent nature. Nature is where we came from and all growth is based on its principles. Physical problem solving abilities and healthy individuals with physical independence is what physical education should generate. You need variety to grow. You’re going to have failure in order to gain perspective. Make the failure survivable for feedback and continued development. 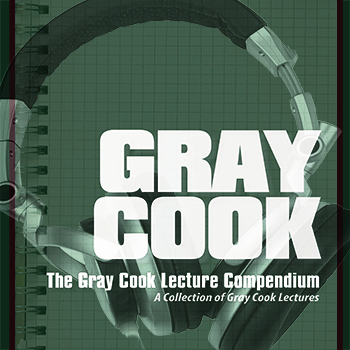 Well said Gray Cook, indeed. Here in Australia we have five inter-related problems which I’m confident would be similar for the USA. Firstly, kids and adolescents sit much more. This has a triple whammy: less activity, poor postural habits, and reduced ‘strength’ of important postural muscles: (incl glute max and paraspinals). Not to mention, poorer diets. Secondly, the sitting is normally associated with (caused by?) TV, computer, smart-phone and tablet use. These, along with social network sites/apps, tend to rewire the brain for instant gratification (thanks dopamine) and discourage sustained activity/fitness session duration and progress over weeks, and personal interaction – face-to-face communication and body language cue development. Thirdly, many school PE are have lost time, resources and experienced, qualified and passionate staff. Many too have been eroded in terms of content – especially aquatics and gymnastics. Some primary schools here in Australia have even banned running/chasey games, the use of soccer and foot-balls, and cartwheels and handstands before school and during recess and lunch. So much for recess once being called ‘play-time’. Fourth, is the intensification of kids/adolescents sports training loads. With impoverished physical activity, underdeveloped postural integrity, reduced body awareness, and a thinner/narrower skills base, many have ‘watered-down’ adult training practises – methods, activities, and loads – imposed upon them. Finally, the certification of so-called experts – often with a 5, 10 or 20 hour (on-line) course – often teaching specialised strength and power exercises. I know far too many late-teens who struggle with body-weight: cannot do a well-aligned full-range push-up let alone a chin-up, and don’t even know what a lunge is.